CONAKRY, Mar 19 2019 (IPS) - Elhadj Mohamed Diallo was a prisoner in Libya between October and November 2017, but he was not helpless. Far from his home in Guinea he understood the power of an organised union. He mobilised other detainees around him to maintain order in the prison and to demand better conditions while in detention. And when he finally returned to his home in West Africa, he used the power of the collective voice again, this time to caution others against experiencing what he did in Libya. 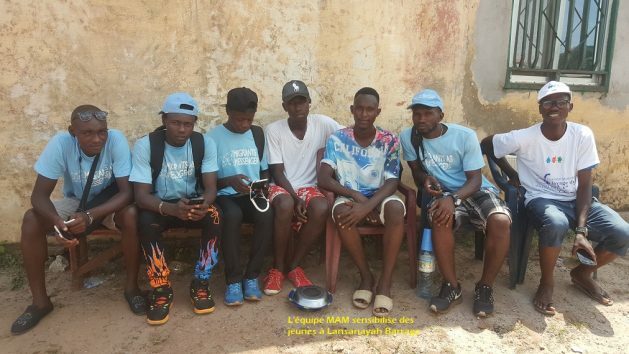 Back in Guinea, Diallo became part of the International Organisation for Migration’s (IOM) peer-to-peer campaign, which is aimed at educating people about the real dangers of irregular migration. The project, known as Migrants as Messengers (MAM), trains returnee migrants to interview and record on camera returnee migrants. They are also taught how to publicly speak about their own stories. As part of the campaign, the returnee migrants, who are volunteers, also attend community events where they speak in public about their own stories and first hand experiences. The aim is to capture and present authentic and balanced stories about their migration experiences and their reintegration back home. These are shared on social media as well as through local media. Diallo, who was incarcerated in Libya for being an irregular migrant, understood how a group of people with a common cause could become a powerful influence for change. So he create an association with about 50 other young returnees migrants, to caution people against irregular migration. “The fact that we managed to mobilise people of many nationalities in a prison, [I thought] why not call the migrants here to make an association? I contacted those with whom I was in prison in Libya. IOM has called us for the project Migrants as Messengers. After the training, as we were bonded, we said we continue like this,” he told IPS. “The objectives are to sensitise young people to abandon irregular migration, to set up reintegration projects to reintegrate migrant returnees first and to attract potential migrants to invest in our projects. [It aims to show them how] to succeed at home,” Diallo said. The association is still very young, but is making progress. Highly motivated, the association members willingly share their experiences in neighbourhoods and public places. They have conducted sensitisation campaigns at universities, through traditional media and social networks and also meet with other returned migrants to help them tell their stories. They plan to work in partnership with businesses and other employment providers to promote the professional reintegration of returned migrants. *Additional reporting by Issa Sikiti da Silva in Cotonou, Benin.